A couple of weeks ago I published a video about how to use the Audio Player for Google Slides Chrome extension. That extension was updated this week. The updated version of Audio Player for Google Slides gives you the option to have your music play continuously through your slideshow. The previous version of the extension only let you add music to one slide at a time and if you needed that music to play throughout the presentation, you would have to add it to each slide. The update to Audio Player for Google Slides will let you have your music played without interruption throughout your presentation regardless of how quickly or slowly you advance your slides. In addition to the new features in the mobile app, the Flipgrid website has a new feature for teachers. That feature is the #GridPals tab in your teacher dashboard. Under the #GridPals tab you will find an option to make your teacher profile public for other teachers to find so that you can connect your classrooms to participate in each other's Flipgrid topics. In other words, you can become virtual "penpals" or, in this context, "videopals." #GridPals could be a great way to connect your classroom with another. You could connect to talk about topics in the news or just to talk about what life is like in a different part of the world. 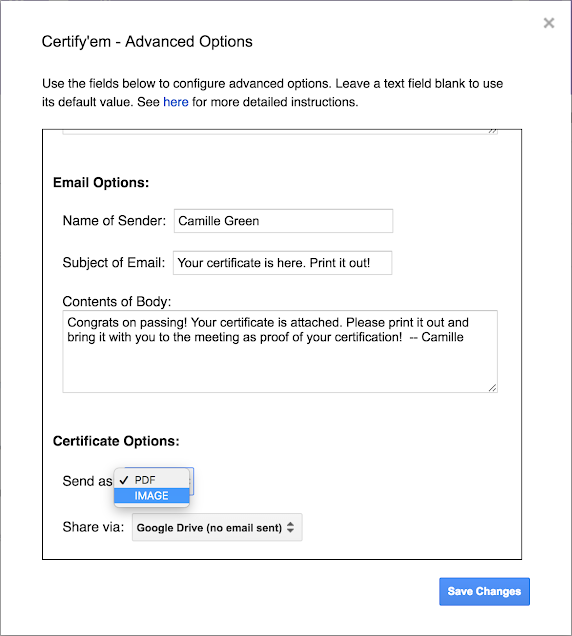 Certify'em is one of my favorite Google Forms Add-ons. 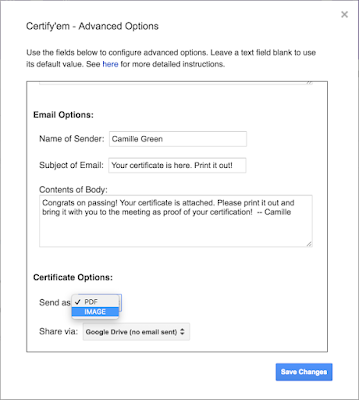 With Certify'em activated you can automatically issue certificates to students when they get a passing (or better) score on a quiz in Google Forms. You can see a demonstration of how it works right here. This week the developer of Certify'em, Dave Abouav, added some advanced options to the Add-on. The Add-on now lets you issue certificates as PDFs or as images. More significantly, you can now automatically issue certificates to students even if they don't have email addresses. In the advanced settings in Certify'em you will now see an option to issue certificates via Google Drive instead of via email. This is perfect for students who don't have email addresses but do have Google Drive accounts through your school's G Suite for Education account.